Elizabeth Chang, violinist, has established a multifaceted career as performer, teacher, and arts administrator. She has given solo recitals and master classes throughout the United States as well is in Europe, South America, and China, and she has appeared as soloist with orchestras both in the US and in Europe. She is currently a faculty member of the University of Massachusetts Amherst and the Pre-College Division of the Juilliard School. A native New Yorker, Ms. Chang’s primary teachers were Louise Behrend, Joseph Fuchs, Roman Totenberg, Max Rostal, Leon Kirchner, and Luise Vosgerchian. She is a graduate of Harvard University and was the recipient of the Presidential Scholar in the Arts Award and the Beebe Fellowship for Study Abroad awarded by New England Conservatory. Ms. Chang is Artistic Director and founding member of the Lighthouse Chamber Players, a chamber music festival on Cape Cod. In recent summers she has participated in the Green Mountain Chamber Music Festival, the Vianden International Music Festival, the Interharmony Festival, the Aria International Music Festival. She has toured extensively and recorded with the Orchestra of St. Luke's and the Orpheus Chamber Orchestra. She has appeared as a guest with the Perspectives Ensemble, Ensemble Sospeso, Sequitir, the Walden Chamber Players, the Smith Chamber Players and many other groups. 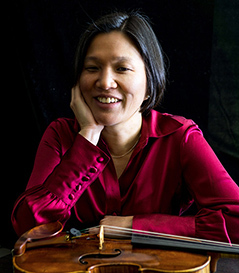 Ms. Chang was formerly an Artist Faculty member of New York University, the Mason Gross School of the Arts at Rutgers University, and The School for Strings. She co-founded the NYU Intensive Quartet Workshop in the summer of 2002 and founded and directed The School for Strings Intensive Chamber Music Workshop from 2003-2007. She is also co-organizer of the Five College New Music Festival and the UMass Amherst Bach Festival. In 2012 she co-founded the Saone-et-Loire Chamber Music Festival in Burgundy, France.